There has been a drought in California. There has been a shortage of posts on this blog in addition to the severe lack of precipitation. Despite the drought, this fountain in the heart of downtown Livermore, California continues to put forth cascades of water. It once seemed like an excess when the average resident was going to great lengths to conserve the precious water. My worries were put at ease when I learned that the fountain used recycled water. The symbol of abundance in the Livermore Valley was a challenge to capture in this sketch. I see several errors in the structure of the trellis, but I tell myself that this is a sketch. The goal is not to make a completely accurate rendering, but rather capture the essence of the scene. I hope that was achieved. 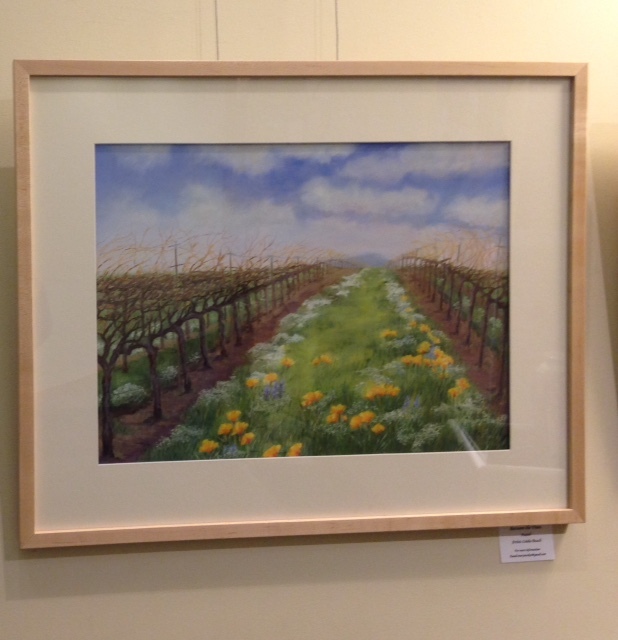 The exhibit “Grapes to Wine in Art” is on display at the Livermore Library. My pastel, “Between the Vines” is included in the gallery show which is one of the programs related to wine country living. The event pairs art, the book, “A Good Year” by Peter Mayle, movies, lectures, and geocaching that involve the community with all things wine related. It was good to see so many at last night’s artist reception enjoying the variety of art. The show features pastel, watercolor, oil and acrylic paintings, photographs, collage, and painted ceramics. “Between the Vines” is a studio painting inspired by a spring scene at a local Livermore vineyard. I was drawn to the profusion of wildflowers between the rows at Wood Family Vineyards. The vines shown with perspective awaited pruning and reached to the clouds in the sky. Painting notes: landscape with one point perspective on Wallis museum paper. I used an underpainting of pastel washed down with water.